3 Bedroom Semi Detached House For Sale in Burnley for £169,995. 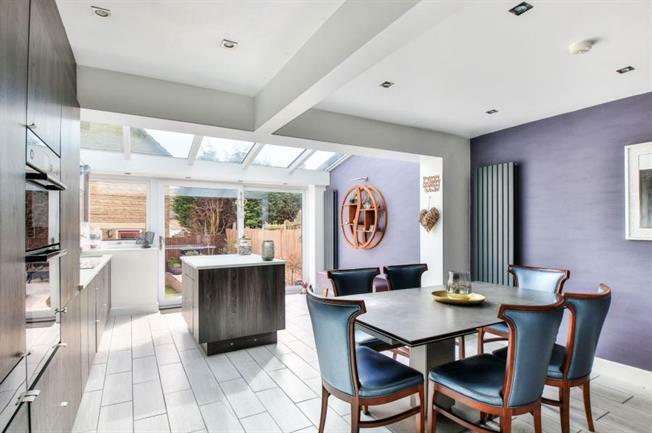 STUNNING MODERN SEMI WITH BEAUTIFUL KITCHEN/ORANGERY EXTENSION! This is one of the best 3 bedroom homes on the market in the area and your immediate interest is required. Having undergone major refurbishment and extension to incorporate a magnificent open plan dining fitted kitchen with integrated appliances/ orangery area and will be extremely popular with families. The tastefully and neutral decor accommodation provides a ground floor cloak room, separate lounge, 3 generous sized bedrooms, modern family shower room,, gas central heating with modern combi boiler, recently replaced upvc double glazing, landscaped garden to the rear and double driveway. This home is located within a quiet cul de sac and is within a short walk of St Mary Magdalene and Wellfield Primary schools. The motorway network is only minutes away providing access to Manchester and the north west area. Viewing is strongly! Via Upvc double glazed entrance door to hallway with fuse box, coved to ceiling. Low level wc, inset basin with contemporary unit, part tiled wall elevations, upvc frosted double glazed window to front, tiled floor, contemporary style radiator. A modern contemporary family kitchen which has been recently extended with an orangery area to the rear to create ideal living space, comprising of a range of newly fitted wall and base units, Granite worktops, integrated appliances to include, double electric oven/grill, induction hob with extractor hood over, dishwasher, housing and plumbing for washing machine, housing for fridge/freezer, sliding pantry/larder cupboard, centre island with built in cupboards under, sink unit with chrome mixer, tiled flooring, 2 contemporary style radiators, self cleaning glass roof to extension, cupboard housing GCH combi boiler, upvc double glazed window and sliding patio doors leading onto garden, built in under stairs steerage cupboard, LED spotlighting to ceiling and under counter. composite Rock door to side. Upvc double glazed window to rear, fitted wardrobes, built in storage cupboard, radiator. Upvc double glazed window to front, radiator, access to loft with retractable ladder. Superb modern suite comprising of a glass enclosed walk in shower with multi jet shower unit, modern unit with inset basin and low level wc, tiled walls, towel radiator, recessed shelving with LED lighting, upvc frosted double glazed window to rear, tiled floor, extractor fan. There is landscaped enclosed rear garden with Indian sandstone patio area, lawn, gated side access, water tap, timber storage shed, exterior lighting. There is off road parking for 2 cars with a private driveway located at the side/rear of the property.